Hi everyone! I’m Lucy. The main things you should know about me are that I’m Chris’s girlfriend, I’m a writer, and on April 22nd I’m taking part in the 38th Virgin Money London Marathon. The reason I’m writing this is to invite you all to Wendron Cricket Club this Sunday, April 15th, for my cake sale fundraiser. A semi-reliable source has told me that cyclists are fueled by cake so I’m hoping this might interest you all. All money raised will be going straight to Mind, the charity I’m very proud to be running the marathon for. It’s also a cause that I feel very strongly about. Without sounding like I’m just reeling off statistics, 1 in 4 of us will experience some kind of mental health issue. There isn’t a type of person that they affect more and they could strike at anytime. Our awareness and understanding of mental health has got better over recent years, but there is still so much more to be done. While I’ve never personally been diagnosed with any mental health issues, I have experience periods of very low self confidence and just generally being overwhelmed by everything around me. Running has always given me a chance to deal with those feelings. 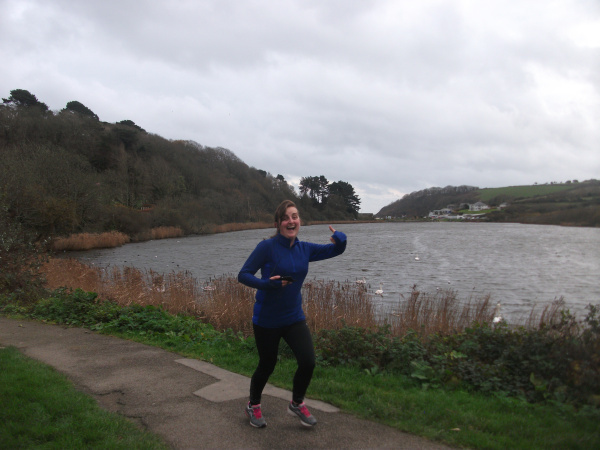 It’s not a quick fix by any means, but I always think if I can run around the hills of Falmouth I can pretty much do anything. I’ve wanted to run the London Marathon for many years and I can’t believe that in just a few short days my dream will become real. Training has gone well and I’m currently tapering so I’m fresh and ready. As with any endurance event, it hasn’t always been easy to get out in the pouring rain and the howling wind. Or the cold. Or the days when you think the sun will never come back. But I’ve done it. I’m here and I’m prepared to take on whatever those 26.2 miles have in store. So, there we have it! Thank you for taking the time to read this, and I hope to see you on Sunday. It would be great if as many people as possible could support this please. Just pop in after your ride. Cakes for sale from 12-3 and the bar will be open. I will be dragging the long ride there on the way home.